Across the globe, doctoral education is in the throes of change. Diversification, regulation and proliferation are just a few of the developments that pose major challenges for those supervising doctoral candidates. the evaluation and dissemination of practice. The book builds on the success and practical knowledge of the first edition and has been re-written and extended to take into account the latest scholarship in doctoral supervision, address new contemporary themes and present updated examples and case studies. 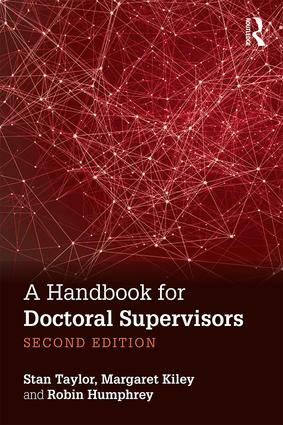 With a self-interrogatory style which enables supervisors to reflect upon and, where appropriate, consider how to enhance their practice, this book is an essential read for anyone involved in doctoral supervision. Stan Taylor recently retired as Director of the Centre for Academic and Researcher Development, Durham University, UK. He is an Honorary Fellow of the School of Education. Margaret Kiley holds an adjunct position in the Research School of Arts and Humanities at the Australian National University, Canberra and cojoint with the University of Newcastle, Australia. Robin Humphrey is a Reader and Director of the Postgraduate Research Training Programme in the Faculty of Humanities and Social Sciences, Newcastle University, UK.